Born in 1870 at Ham hill in Worcester Lord Alfred Douglas is best known for his passionate and tempestuous love affair with Oscar Wilde. Generally blamed for Oscar Wilde�s tragic downfall Lord Alfred Douglas (henceforth referred to as Bosie) has had an unfair and unsympathetic press since his death in 1945. Ignoring Bosie�s love for and loyalty to Oscar, writers on Oscar Wilde tend to portray Bosie as venomous and brattish. There is, however, another side to what is in actual fact, an incredibly complex story. Most of those who write about Oscar and Bosie take their views on Bosie from only one main source: De Profundis, Oscar's protracted and bitter prison letter. For the uninitiated, in this letter Oscar sets out a convincing and highly plausible argument that Bosie was to blame for his tragic downfall. Throughout the letter Oscar produces a catalogue of complaints against Bosie. He sets down his faults and his mistakes for all the world to read, and he spares this man whom he once loved nothing of his usual tolerance charity or kindness. I do not propose to quote form the letter here, as readers can acquire it for themselves from their nearest library or bookshop if they have not already done so. When Oscar wrote De Profundis it was of course, not called De Profundis, but was simply a letter addressed to Bosie. When Oscar came out of prison, he left instructions with Robert Ross - later his literary executor - that a copy of the letter should be taken, and the original sent to Bosie. Ross however disregarded Oscar's instructions, keeping the original and sending Bosie the copy. Because Bosie denied ever having received it, it is difficult to gauge whether Ross did or did not send Bosie a copy as he claimed. The story is that Bosie tore it up after reading the first few pages - but Bosie later reviewed the edited version, unaware of what the fuller version contained. His review, although not ecstatic, was benign. Wilde, it is presumed, had intended the letter for publication - hence his reason for taking a copy. But then, no more is said of the letter. Oscar does not broach the subject with Bosie. Oscar dies. The letter - along with a collection of other letters from Bosie to Oscar - falls into the hands of the unscrupulous Robert Ross. In 1913 Bosie sued Arthur Ransome for libellous passages in his book 'Oscar Wilde'. Ransome, who was coincidentally a close friend of Robbie Ross from whom he probably obtained the libellous passages - pleaded justification. The case centred around whether, as Ransome claimed, Bosie really was ruinous to Oscar's life. The evidence for this claim was supported by the disclosure of the suppressed portions of De Profundis, which was brought out of hiding in the British Museum, read out in court, and subsequently published in the national newspapers. After nearly fainting Bosie left the courtroom in a highly distressed state, and consequently lost the case. After that, for over a decade, Bosie lived in loathing of his ex-lover and all memory of Oscar was tainted; all thought of him tarnished with this one act of treachery: a letter which is still capable of causing Wilde scholars to be divided against each other. Whether the events recorded in De Profundis are true or not, it is impossible to make out. We have only Oscar's word for that, since Ross was able to obtain an injunction preventing Bosie from writing his reply as he had wanted to. Instead, he penned 'Oscar Wilde and Myself', a book he fiercely repudiated after managing to reconcile himself to Oscar's memory. Additionally, he testified in the controversial Pemberton Billing trial, in which he damned Oscar and all that he had come to represent. However, this period of bitterness ended in 1928 when Bosie went to prison himself for a libellous attack on Winston Churchill. Having experienced a taste of prison conditions for himself, he could now feel only pity for what Oscar had suffered, and he began to regard Oscar's memory with his former fondness and affection. 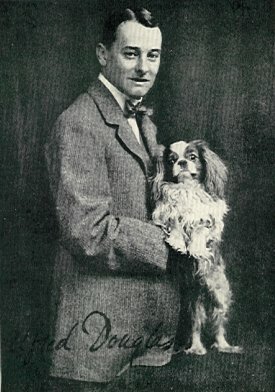 Bosie's later books show his love for Oscar, a love which having once been clouded with bitterness, reasserted itself in Bosie's latter years. Marie Stopes tells how Bosie wept when he recounted his time with Oscar, and in his final book, 'Oscar Wilde: A summing up', Bosie writes of Oscar as the man whom he will always love. The reason for Bosie's bitterness towards Oscar was not only De Profundis, but also the nature of Oscar's general behaviour to him in his last years. What we can know of Oscar during this period in his life is that he was not always as kind behind Bosie's back as he was to his face. He wrote continually of Bosie's meanness while accepting large sums of money from him. Bosie's bank statements prove that he gave Oscar a lot of money. They total over a thousand pounds. My theory on this is that, while in prison, Oscar's visitors tried to poison his mind against Bosie so that he would not return to him when he was released. Continually told that Bosie no longer cared for him, Oscar eventually believed this. Hence he writes in De Profundis of how Bosie had his freedom and luxury in contrast to Oscar's own penury and imprisonment. This bitterness never left Oscar and was never resolved so that Oscar, even after he was reconciled with Bosie, retained a deep resentment of him. This resentment resurfaced in spiteful outbursts in letters to other people, and was always in the background for the remainder of Oscar's life. This resentment was exacerbated by Oscar's anxious preoccupation with money-matters and worries about where his next sum was to come from. In De Profundis Oscar blames Bosie for not writing to him, but he had, prior to that, turned down letters from Bosie in favour of those from his wife. (He was only allowed to receive limited correspondence). Bosie was hurt and bewildered by this, as is evident from his desperate letters to More Adey, in whom he then confided. Because Bosie's love-letters to Oscar were almost certainly destroyed by Ross, we now have no record of Bosie's love for Oscar except in his letters to other people. All we have are Oscar's letters to Bosie. The picture the world gets is thus of a hopelessly one-sided affair for which Oscar risked everything, Bosie nothing. There is only one letter of Bosie's which survives: it is one he wrote to Oscar while he was awaiting trial in which he told him, 'Do keep up your spirits my dearest darling.' Bosie was distressed when he heard that Oscar had not been getting enough to eat. In itself, this shows Bosie's utter naivety about the prison system: not his 'shallowness' but his innocence. In De Profundis Oscar records in detail every blighted moment with Bosie, every slight, every misdemeanour and every slur of tact. We get a picture of an unwholesome and sordid affair - dark in the extreme. But what about it's lighter side? For most of the public the myth of Oscar and Bosie is of a stormy and tenuous love affair, always toppling on the brink of disaster. But there was a lighter side. Bosie used to talk about how he and Oscar laughed through each day, shared a sense of humour, and of how Oscar could always lift his spirits. Both Oscar and Bosie were deceived and duped by interfering go-betweens, well-meaning or otherwise - and at the end of Oscar's life, were largely at cross-purposes. During Oscar's imprisonment Bosie spent an agonising two years unable to write to or to speak with Oscar. He wrote two extensive articles in Oscar's defence, trying in his own naïve way to make the world understand their love. But they lived in oppressive and difficult times. Bosie's attempts to justify his love failed. Oscar rejected Bosie's efforts, the articles were withdrawn and Bosie was wounded and dismayed. Unfortunately this encompasses such formidable scholars as W.H. Auden, and the late Richard Ellman, whose 1987 biography "Oscar Wilde" is to some extent responsible for the resurgence of interest in Oscar's life and work. Melissa Knox: A Long and Lovely Suicide. David Hare's play The Judas Kiss - somewhat predictably, given its title - also vilifies Bosie, as does the recent Fry film "Wilde". The Wilde film is perhaps slightly more sympathetic , acknowledging Bosie's family difficulties, but he still comes over as shallow and heartless. The books I have mentioned are culled from a selection of recent literature, but they reflect the ill-considered public belief that Bosie meant to harm Wilde. Even if they concede that he did not, he is rarely credited with a capacity for remorse or pity. Prewitt-Brown, for example, claims on rather scant evidence that Bosie was incapable of remorse for what happened to Wilde. Dowling too, claims that Bosie failed to live up to Wilde's ideals. Maybe this is true, but perhaps one shouldn't have ideals? Rather than being 'neutral', these books are written with an anti-Bosie bias; despite in other ways being balanced scholarly works. The purpose of this web-site is to challenge the popular view of Bosie, which blames him far in excess of what he could be held responsible for. He is not to blame for Oscar taking the case to court. In a letter to Ross Oscar confesses that he sees no alternative but to prosecute. He had made this decision before consulting Bosie. Bosie was responsible for his own actions, but he cannot be held responsible for Oscar's, or anyone else's behaviour. It is my contention that the reason why Bosie has become the scapegoat has little or nothing to do with the real facts behind the case. People blame him because the public still cannot accept responsibility for what happened to Oscar. Rupert Crofte-Cooke argued this in his biography on Bosie, "Lord Alfred Douglas, his Friends and Enemies." I do not believe that Bosie was, literally, in any sense 'innocent' of the accusations in De Profundis. Nor do I believe that the darker side of his relationship with Oscar was non-existent. Bosie was no angel. He could at times be a brat, and he could be rude, offensive and cantankerous. But he was also generous, loyal and devoted to Oscar. I would be interested to know what people think of my website. Any comments, contact me at the address below. Julia Wood. Leicester. 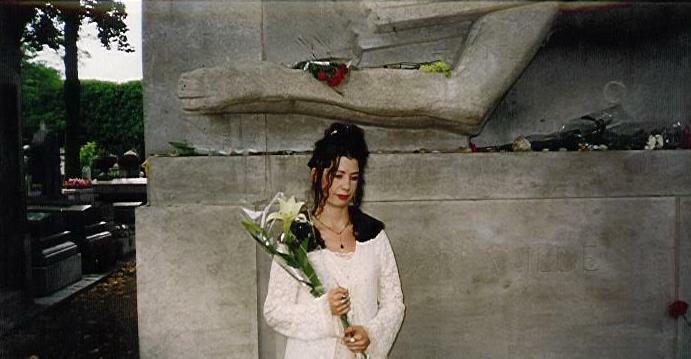 October 1998. The copyright in all quotations and extracts from Lord Alfred Douglas's poems and letters owned by the Estate of Lord Alfred Douglas deceased are reproduced by kind permission of Mrs Sheila Colman. All rights reserved, no other reproduction of these works is permitted. From lips long-closed in failed apology. To close the portals of eternity. Where poets blaze in starry martrydom. This sonnet was composed after the instalment of the window for Oscar in Westminster Abbey in February 1995. It was a highly emotive and moving experience, both personally and collectively. The photographs were taken in August 1998 when I visited Oscar's grave, without doubt the most incredible and moving experience of my life.